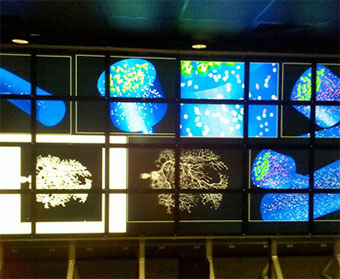 Images of the cells Fidel Santamaria works on in his UTSA lab. (Oct. 8, 2018) -- It’s about the size of a dinner table; yet, one day may influence conversations held around the kitchen table. This is what excites researchers at UTSA as they anticipate the arrival of a state-of-the-art microscope. This device, known to a very select few, as a two-photon holographic microscope, will be used to write commands directly into neurons, including human, and get us closer to understand disorders such as Autism, which affects so many families in the United States today. According to Santamaria, there are about two dozen of these microscopes in the world. The National Science Foundation and UTSA awarded close to $840,000 towards the technology. One main reason UTSA won is because the team, assembled by Santamaria, that will have access to the device is diverse, spanning a broad range of topics across multiple disciplines, with neuroscience the main focus. It is estimated that a single neuron has about 10,000 synapses to communicate with another neuron, and yet much neuroscience is still focused on stimulating larger regions of the brain, known as bulk stimulation. According to Santamaria, this is a method with limitations that the new microscope will be able to address. “In our case, we will have microscopic precision to activate specific pathways in the brain. Only when we have control and know the type of information that we are ‘writing in’ the circuitry of the brain and ‘read out’ the activity of the neurons, then we will be able to truly understand how the nervous system works,” says Santamaria. In two-photon holographic microscopy, a powerful laser is used to project a movie in 3D of the researcher-programmed neural stimulation (or inputs) unto networks of neurons in living tissue. Simultaneously, a second laser is used to record the response of the neurons to this stimulation. Through this process, it will then be possible to determine how the nervous system, in health and disease, transforms inputs-into-outputs. Obtaining this microscope required a multi-disciplinary team across the College of Science and Engineering. Santamaria collaborated with Gabriela Romero Uribe, from biomedical engineering, to secure the winning grant. The activities of this award will promote multi-disciplinary science communication proficiency of undergraduate and graduate students at UTSA. There will be opportunities for students to understand state-of-the-art microscopy techniques and build multi-media accessible information to be made available to the general public. The device will be a catalyst to promote interactions among groups across campus and serve other initiatives such as the Brain Health Consortium of UTSA. This new technology will help understand how the contribution of incorrect wiring impacts the function of certain regions of the brain. “We can activate the connections between neurons, known as synapses. More importantly, we can train neurons to respond to a specific pattern of synaptic activity. In that way, writing in a memory into the circuit,” says Santamaria. Visit Fidel Santamaria’s lab to learn more about an upcoming international symposium he is co-organizing taking place in San Antonio, where thought leaders will gather to develop new theories on brain function. Learn more about the UTSA Neurosciences Institute. Learn more about the UTSA Brain Health Consortium. Learn more about Gabriela Uribe’s work.